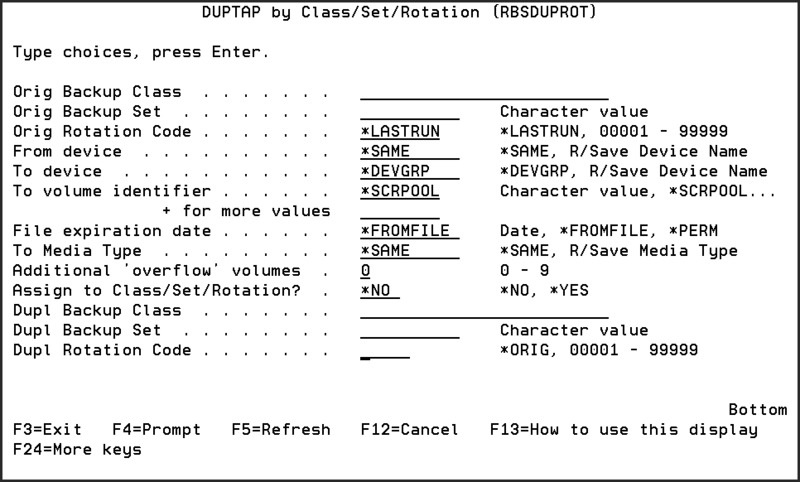 The Robot Save DUPTAP by Class/Set/Rotation (RBSDUPROT) command allows you to duplicate a volume used by Robot Save. Robot Save tracks both the original volume and the duplicated volume. To help you manage duplicated volumes, option 11, Tape Cross Reference Inquiry, on the Save Media Management Menu displays volume information for both the duplicate and the original volumes. Press F8 to print a report of your duplicate volume information. The Volume Inquiry panel also displays duplicate volume information. Duplicating volumes using the RBSDUPROT command is considered an ad hoc operation. If you want to release the duplicated volumes to the scratch pool when their data expires, make sure to specify Y (Yes) in the Release expired Adhoc tapes to scratch field on the Media Defaults panel. When you submit or schedule the RBSDUPROT command, both the RBSDTALIB and RBSPGMLIB libraries must be in your interactive library list. The command is located in RBSPGMLIB, but uses files from RBSDTALIB. If you are scheduling the RBSDUPROT command using Robot Schedule, display the Control Options panel and enter RBSPGMLIB/RBSJOBD in the Job Description fields, and *JOBD in the Library List Name field. The following describes the fields in the RBSDUPROT command. Orig Backup Class Enter the backup class to which the volume you want to duplicate currently is attached. Enter the backup set to which the volume you want to duplicate currently is attached. Orig Rotation code Enter the rotation code of the volume to be duplicated. To enter a specific rotation code, enter the code with leading zeroes. Specify *LASTRUN to select the last rotation used by Robot Save. From device The From device is the device where the original volume is mounted. Enter the name of a device, or specify *SAME to use the same device Robot Save used to save the data. To device The To device is the device used for the duplicate volume. Enter a device name, or specify *DEVGRP to use a device in the same group as the original device where the data was saved. To volume identifier The To volume identifier is the volume to use for the duplicate volume. You can enter the name of a volume; *SCRPOOL to select a volume from the Robot Save scratch pool; or *MOUNTED to use the volume that currently is mounted. File expiration date You can specify an expiration date for the duplicate volume. Enter a date using your system date format. Enter *FROMFILE to use the same expiration date as the original volume. Enter *PERM if the duplicate volume is permanent, with no expiration date. Enter the media type to be used for the duplicate volume. Enter the number of additional volumes that may be required to complete the duplication process. Specify *YES if you want to assign the duplicate volumes to a specific Class/Set/Rotation. Otherwise, leave as the default *NO. Enter the name of the backup class to which the duplicate volume should be assigned (if you specified *YES above). Enter the name of the backup set to which the duplicate volume should be assigned (if you specified *YES above). Enter the rotation code to which the duplicate volume should be assigned (if you specified *YES above). Specify *ORIG if you want to use the original volume's rotation code, or enter a new rotation code.